Having my kindergarten students form a complete sentence is a huge part of writing in kindergarten. I want my students to understand that sentences begin with an uppercase letters, when to use uppercase and lowercase letters, there are spaces between words, and we end with punctuation. 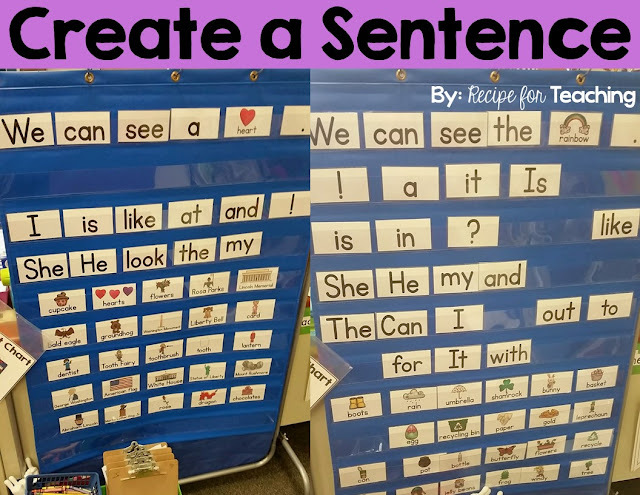 I found a great way to help build my students' confidence with forming a complete sentence by using Create a Sentence activities at our pocket chart center. At this center my students use the word and vocabulary picture cards to form sentences or questions. The words are word wall words that we have learned and are familiar with. I have a recording sheet for them to write their sentence and draw a picture to go along with it. There are clipboards, pencils, crayons, and pointers at the center. I have found a lot of success with using this in my classroom. My students are excited about writing and they love to share their sentences they create. I have a "sharing basket" that students drop their center work in. We share work after we finish centers and they are always so proud to share. These are cards from my Create a Sentence Winter Themed Pack. You can see in this picture that the friend working here created two sentences! These are cards from my Create a Sentence February Themed Pack. 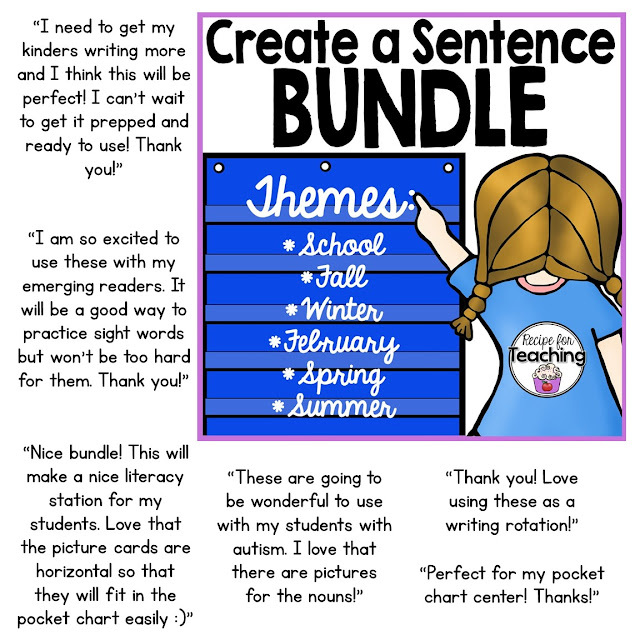 Here are some student work samples from my Create a Sentence February Themed Pack. I just love their drawings! How cute is that Rosa Parks drawing?!?! LOVE! And is that not the cutest George Washington?!?! These are cards from my Create a Sentence Spring Themed Pack. I love how this friend created a question! I don't always put out every word in the pack depending on words we have learned or space in the pocket chart. I also like to laminate the cards from durability. A recording sheet is included in each pack for students to record their sentence on, but you could also have them record in a notebook or other paper if needed. My students absolutely love these and they love when they see me getting a new set ready. I love when they get so excited about something new in our classroom! I have several different themed Create a Sentence Packs in my Teachers Pay Teachers Store. 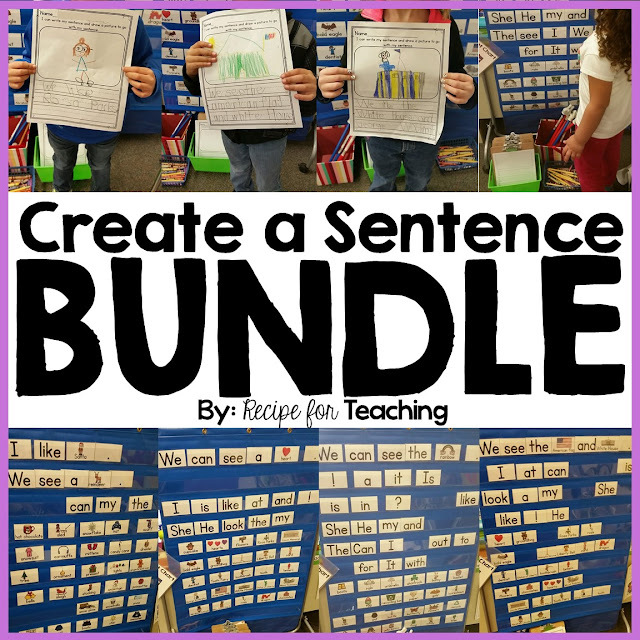 I also have bundled all of the Create a Sentence Packs together. Click the image to check out the bundle! 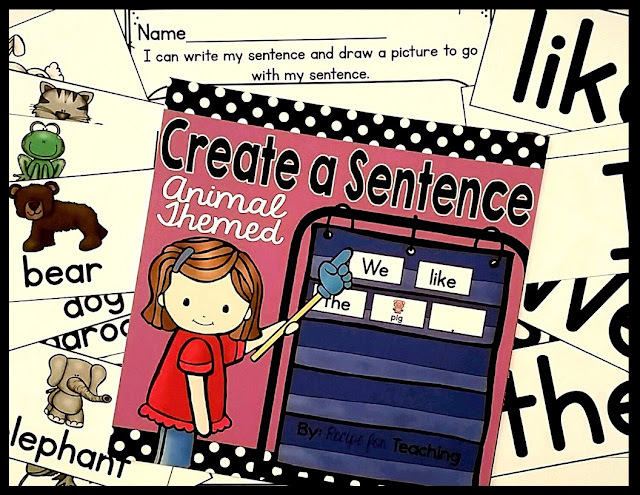 Since I have received some of the sweetest feedback from these sets, I created a Create a Sentence Pack Animal Themed FREEBIE that you can try with your students! Just click the image to check it out in my Teachers Pay Teachers Store. If you use this with your students, be sure to tag me on social media! I hope your students love using these Create a Sentence Packs as much as mine do!